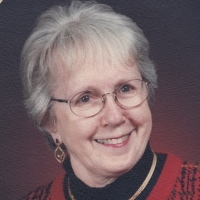 Mary Louise Lehr Harms died on April 6, 2019 at St. Francis Hospital, Wichita from ALS. During her final stage of life, she was surrounded by many family and friends. Mary Lou was born July 7, 1932 at home in Skelly Refinery housing in El Dorado. She was the fourth of seven children and the first girl born to Leo Paul and Nellie Marie (Walker) Lehr. Mary Lou attended St. John’s Catholic School through 8th grade then attended El Dorado High School where she graduated in the Class of 1950. A special group of high school girlfriends that she was a member of was known as the “Fidgety Fifteen”. Mary Lou went onto El Dorado Junior College and graduated with a business secretarial degree. She was united in marriage to Lloyd F. Harms on May 16, 1953 and he preceded her in death on July 30, 1997. Mary Lou worked at the Chamber of Commerce for several years and the Butler County Extension office for several years where she retired from in 1997. She was a faithful parishioner at St. John’s the Evangelist Catholic Church. They have two children - Tom Harms, El Dorado and Paula (Mark) Attebery, Newton. The joy of Mary Lou’s life was her four grandchildren Kaitlin (Adam) Williams, Kallie (Christopher) Rudd, Keagan (Ashley) Attebery, and Keith Attebery. Mary Lou was a big part of their lives as their babysitter and attending all of their activities. Mary Lou had four great grandchildren Jayden Attebery, Haddyn and Paxton Williams, Gracie Rudd and is expecting two more great grandsons this summer. Mary Lou became to them lovingly as GaGaLuLu. Her brother David Lehr, and sisters Katherine Neil, and Sondra Jennings also survive Mary Lou. Mary Lou is preceded in death by her parents, husband, and brothers Bob, Don and Raymond Lehr. Her family will gather with friends on Wednesday from 5 to 7 p.m. at the Carlson Colonial Funeral Home where Rosary prayers will be recited at 7 p.m. Mass of Christian Burial will be celebrated on Thursday at 10 a.m. at St. John’s the Evangelist Catholic Church, El Dorado. She will be laid to rest in Walnut Valley Memorial Park. Memorial contributions in her name may be directed to the ALS Foundation or the Partners in Education Becky Breese Scholarship Fund. Please sign her online guestbook and leave a memory of Mary Lou at www.carlsoncolonial.com.